The value of unit tests and TDD are well documented. Unfortunately, it’s still daunting to start practicing it. Here’s a primer. We’ll use RSpec to test our method’s output. We’ll use red/green/refactor methodology. 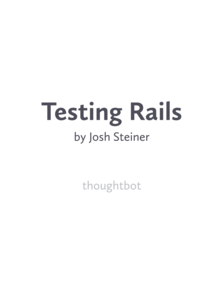 We’ll write unit tests that are fast, isolated, repeatable, self-verifying, and timely. Our test still passes but our method is not fully functional until we write our reversed string to a file. We’re writing a unit test, which should be isolated. We don’t want to create a new file every time we run our test, so we stub it out. We expect the File object to receive the message write one time with the arguments 'example_file' and our reversed string by using the stub’s ability to report on the messages it’s received. This is called white-box testing. We made our new test pass but broke our old test because we are no longer returning the reversed string. This shows the benefit of old tests helping guard against regressions in our code. We now have two passing tests and a fully functional method. We did it writing the tests first. This is a simple example, but by following this process, we can conquer any sized programming task. Writing the tests first will also help us write testable code and help us keep our methods small.